This is my character sheet, or design specification, for Jesus. The purpose of this sheet is to keep a record of the attributes or characteristics of my drawing, so that I can draw a similar-looking cartoon in all future scenes including Jesus. I first began drawing my version of Jesus in January 2008, very early on in the history of Bible Cartoons. Those early pictures were for stories found in John’s gospel. After drawing Jesus a few times I realised it might be a good idea to create a character sheet, containing notes on facial characteristics, hair colour, skin colour, clothing colours and design points, etc which I wanted to remember. By formalising my design in this way I would have a simple and accessible design reference point, which would remind me of what I had drawn in previous cartoons. By referring to this sheet every time I drew a scene including Jesus I hoped I would be able to draw and colour him to match previous cartoons, ensuring great similarity and therefore continuity between Bible Cartoons featuring Jesus, even if these cartoons were drawn months or even years apart. 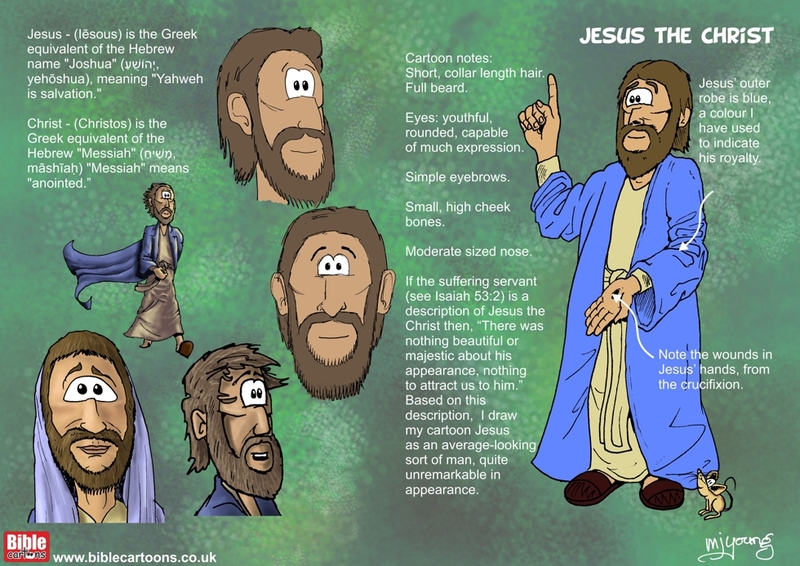 Without this character sheet to refer to I might very well accidentally draw a scene where the Jesus character is quite different from previous drawings, which would be a problem if someone views and/or buys several Bible Cartoons and the same person looks quite different in each scene! There is a very real danger of this happening since my abilities and style gradually change and evolve over time, especially as I learn new art techniques and want to incorporate new ideas into my Bible Cartons. By referring to the character sheet I can be confident that I will draw a similar-looking person, even if my artistic skills have undergone change and development over time. 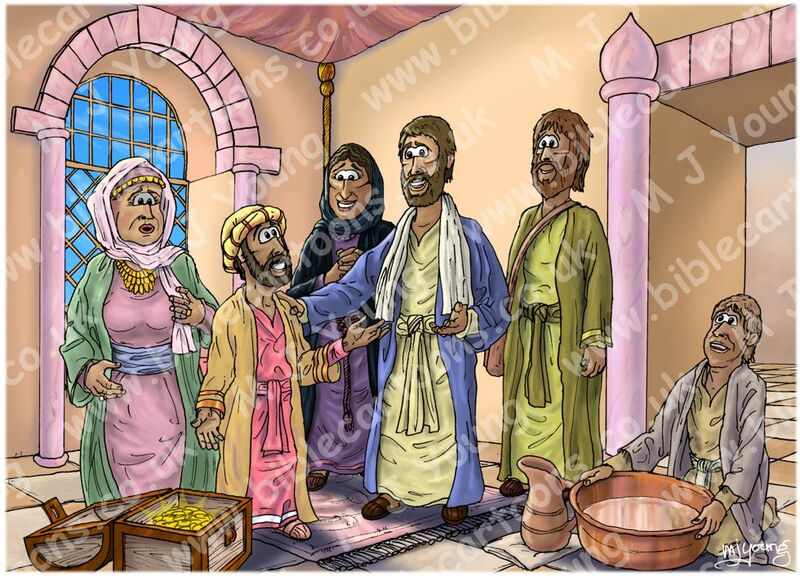 Despite my attempts to ensure design continuity, subtle changes have, of course, entered into more recent Bible Cartoons. If you compare the two scenes below you will see what I mean. 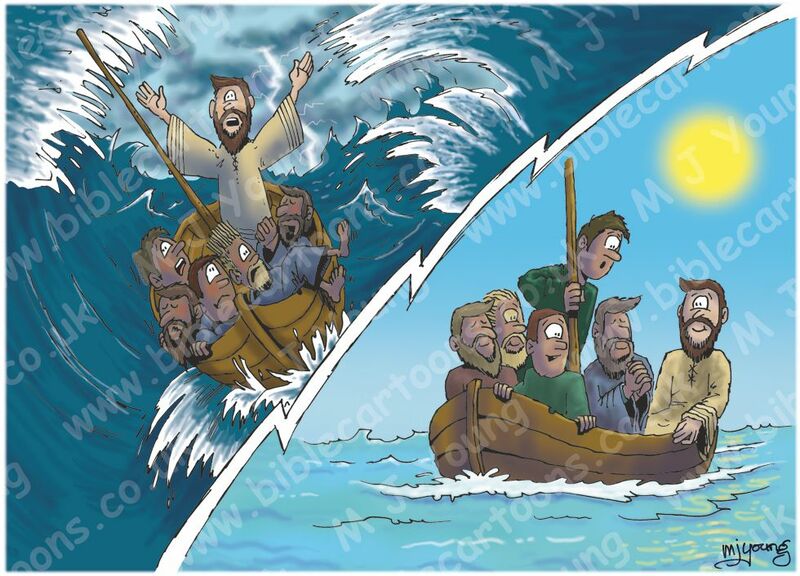 The first picture (Matthew 08 – Jesus calms storm) was drawn in January 2008, whilst the second was drawn in October 2016. You can see how much more sophisticated the 2nd scene is, compared to the first. That is inevitable for an artist who spends a great deal of his time drawing these cartoons! I have researched and leant a great deal in the intervening years between these two scenes, and my style and ability have changed with each new discovery. Nevertheless, I hope you can see the benefit of my referring to the Jesus character sheet, in that the essential characteristics of Jesus (his blue outer robe, his skin & hair colour, etc) are more or less the same! To distinguish him from others, also named Jesus, the Christ is spoken of as “Jesus of Nazareth” (John 18:7), and “Jesus the son of Joseph” (John 6:42). Most frequently, Jesus referred to himself as the “Son of Man”. The most reliable sources of information regarding the 33 year life of Jesus the Christ on earth are the four Gospels: Matthew, Mark, Luke & John.